messenger which is presently one of their messenger socials hit the milestone in the past month of February. Isn't it amazing? Facebook is going higher day by day. Now, the bot platform inwhich Facebook introduced for Messenger at F8 has grown to include over 18,000 bots — up from 11,000 just in 20 days ago. "As part of this journey to 1 billion, we focused on creating the best possible experiences in modern day communications," Facebook Messenger chief David Marcus said in a statement. "We remain focused on helping connect people to the people and businesses who matter most. Thank you to everyone who uses Messenger around the world, and we're looking forward to connecting the next billion." "WE ARE LOOKING FORWARD TO CONNECTING THE NEXT BILLION"
READ ALSO: How To Transfer Files Wirelessly Using Xender from PC To Your Mobile Phone Or From Phone To PC. Messenger has grown rapidly in this year 2016, gaining upto 100 million active users in every three months. The service hit 800 million users in the month of January and over 900 million in April. 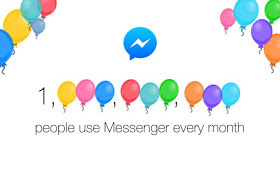 Facebook released a flurry of stats about Messenger, noting that Messenger has become the second most popular iOS app of all time (behind Facebook, of course). It's been downloaded over 1 billion times on Android, and 1 billion messages are sent between people and businesses every month. Record has it to be that many people who are Using this app do send over 22 million GIFs a day, and 17 billion photos to friends every month through Messenger. It's clear that Messenger has become the golden child within Facebook, and with the company continuing to add features and encourage developers to create bots for the platform, it doesn't look like the growth rate of Messenger will be declining anytime soon.